My childhood memories of Christmas aren’t warm and fuzzy. The holidays were more of a nuisance for my parents than cause for celebration. Which is not to say that on behalf of their only child they didn’t give the season a halfhearted try. I could count on a scrawny tree draped with a strand of bubble lights, the odd ornament here and there, fake icicles and a glittery star on top. Though money was always an issue, it was rare that I was deprived of the Lincoln logs, tinker toys and Chinese checkers that littered the post-season bedroom floors belonging to more well-to-do families whose children I sometimes played with. There were Christmases when I found under the tree an electric football set, a Daisy pump air-rifle and a basketball goal that never got nailed up. But, there were also mornings when apples, oranges, hickory nuts and a hammer signified that year’s bounty. Which is to say that Christmas in our household was mostly a wait and see proposition. On the way to becoming a successful songwriter, I was blessed with the births of four daughters, each of them accompanied by a hefty royalty check. Which triggered my belief that some children enter the world with their own money. Since the arrival of my first child, the Crowell family has detonated forty-one Christmas bombs, discarding in that time-span enough wrapping-paper to be held accountable for the deforestation of, I’m guessing here, twenty-plus acres of prime timberland. In defense of our participation in the commercialization of baby Jesus’s birth, the best I can offer is the fact that for the last two decades we’ve conscientiously recycled the aftermath. A few years back it became evident to my family, and indeed myself, that I’d gone sour on all things related to Christmas, a source of particular disappointment to my wife, Claudia, whose creative flair peaked with the holidays. Sentimental music, sugar cookies, sparkly decorations, family warmth and thoughtful gift-giving are as much a part of who she is as her intelligence, humor, natural beauty and kindness. In contrast to her plentiful cheer, by the end of the new millennium’s first decade, my contribution to the yule-tide spirit of giving and receiving had been reduced to mumbling a few sullen words about replenishing my socks and underwear drawer. As for presents for those I love, my imagination had grown even duller. One rather warm December day in 2011, I heard on satellite radio, Hayes Carll’s soulfully written “Grateful for Christmas” and was so moved by the song---it’s wry humor and bare-bones honesty---that I ditched whichever errand or appointment I’d set out on in favor of an honest-to-God Christmas shopping spree. Main Street in downtown Franklin, Tennessee is a six-block slice of small-town Americana, lined on both sides with small businesses, store-fronts and a fine-dining restaurant boasting a vintage drugstore/soda-fountain sign from the 1930’s. It was there, in less than three hours, and without setting foot in the mall, that I managed to snag a carload of meaningful presents for my family and close friends. Much to Claudia’s surprise, this new-found merriment lasted well into the new year. Not only did “Grateful for Christmas” jolt me out of a self-indulgent funk, it also tweaked my creative curiosity. I began mulling over the idea of writing an album’s worth of original Christmas songs. As far back as the early eighties, for fun and without bothering to put words down on paper, I’d made up with my two oldest daughters, Hannah and Caitlin, silly little Christmas songs that we’d sing around the house. “All For Little Girls and Boys” is one of those tunes that somehow made it onto a cassette tape. Around the same time, in a proper studio, I recorded with my kids a carefree piece I’d written called “Very Merry Christmas,” which, in lieu of Christmas cards, we sent out that year on cassette tape. In the mid-nineties, during a writing session, Chuck Cannon and I were forced to bail on whichever hit-song we were trying unsuccessfully to coax out of hiding and instead penned “Christmas Makes Me Sad.” Both Chuck and I thought it was a perfectly fine Christmas song, but neither of us attempted to do anything with it. Perhaps ten-years-later, Mary Karr and I were just beginning to collaborate on songs for the album Kin: Songs by Mary Karr and Rodney Crowell. “Christmas in Vidor” (Vidor is a small town on the Texas/Lousiana border) is the second song we wrote together. “Vidor” didn’t fit the record we had in mind but I held on to the cell phone demo we made in Mary’s New York City apartment just in case. In early 2015, I was touring Great Britain as a member of the Transatlantic Sessions when the notion of writing an album’s worth of original Christmas songs began to creep back into my creative process. However, nearly a year passed before I hit on the idea of writing a song referencing one of those tacky, artificial Christmas trees with the tri-colored light wheel that seemed to flood the market in the early sixties. In the process of composing “Merry Christmas From an Empty Bed,” I sent what I had to Brennan Leigh, who was living in Austin at the time, and asked if she’d write a verse. I was delighted with what she sent back. The Christmas record, I realized, was beginning to take shape. Sometime around Christmas 2016 I came home to find my granddaughters, Addie and Iris---age ten and eight--- sitting side-by-side and playing on our old upright piano a melody that to my ear sounded like something from the early nineteenth century. I asked them what song they were playing and in unison they replied, “something we just made up.” I hit record on my iPhone and asked them to play it again. Using their melody almost entirely, I spent a couple of months composing the words to “Come Christmas.” A generation had passed since I first made up a Christmas song with their mother. Sometime later, in rapid succession, I came up with “Christmas in New York,” “When the Fat Guy Tries the Chimney On For Size,” “Christmas For the Blues” and, again with Mary Karr, “Let’s Skip Christmas This Year.” With those tunes in the bag, I began entertaining the rather vague idea of writing something that Spike Jones might have recorded in his heyday. The lyrical ideas for “Christmas Everywhere,” came fast, as did the realization that if I were ever going to realize the song’s compositional possibilities, I would need help from the premier Gypsy Jazz guitarist and composer, John Jorgenson. John and his wife, Dixie, are close friends of mine and Claudia’s and one night after dinner, John and I slipped off to another wing of their house and pulled the song together---including the dream sequence in which a child asks Santa for a time machine in which to go back and prevent John Lennon’s murder. I was finally ready to record an album of original Christmas songs. 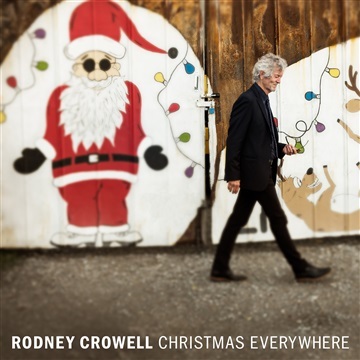 With Dan Knobler producing and some very gifted musicians and vocalists lending their talents, the making of the album Christmas Everywhere rank as some of the most enjoyable recording sessions I’ve ever experienced. The record was close to being finished when it occurred to me that to set the tone for the albums mostly irreverent subtext, I needed to compose a lyrical prelude. In honor of Clement Moore, who wrote the poem we all know as, “The Night Before Christmas,” I came up with a short piece called “Clement’s Lament (We’ll See You in The Mall).” Tania Hancheroff and Kim Keyes stopped by the studio and performed the tune with Jordan Lehning’s orchestral backing and the album was pronounced complete.